The whole 'making-money-online' phenomenon has quite a charm to it. Much and more people are now being attracted towards this side, which I like to call 'the other side' of the internet, since instead of being web-page visitors, some people are now becoming webpage hosters, so to speak. Indeed, for many such people, online advertising has become a major source of income. But many people still don't know fully well about the various advertising options they have. So this post is all about different advertising options that you can try out with your blog / website. Not all ads work in the same way. Some generate more revenue, while others are interactive and help in promoting products. With ads, placement is very important as well. Some might work in a particular place, while other might not.Hence, you have to choose a combination that works best for you. And with so many advertising options, there are literally several possible combinations. It's all a matter of trial and error. You can't decide on the best combination unless you haven't tried some. Knowing your options can pay off here. Before you go on monetizing your blog, you first need to take a look at your analytics stats. First of all, look at your Alexa rankings. Only start advertising if you have a decent ranking. And in my experience, 'decent' means in the top 60-70,000 websites, or 100,000 at the very most! If your rankings are below that (i.e. larger than 100,000), you should not advertise! Work on improving your rank by various methods shared on MBT and SEM! I might write another post on this topic soon. Second, get a decent amount of traffic. In my opinion, around 500-1,000 unique visitors is decent enough. If you are getting a 100 or so visitors and think you can earn a decent living online, don't kid yourself! Set up a traffic goal and work hard on it before monetizing. Why all the hassle? I know I keep on saying this, but your success can only be guaranteed by a decent traffic and a good website ranking. Adding adverts prematurely will do more harm than good. It might drive away what little traffic you might have. Not only that, your bounce rate will go high as well. But if you have a regular and significant readership, the initial impact of adding ads will be cushioned. Cost-Per-Click are the simplest kind of ads. You simple put up ads, and whenever someone clicks on them, you get paid a certain amount. The most popular CPC ad network is Google AdSense, although it now has extended its reach to CPM ads as well. CPC ads are generally low value, and it takes a lot of clicks to generate a decent income. Not only that, the awarding criteria is a bit hazy as well. You don't always get paid a fixed amount, nor do you get paid each time. Still, this form of advertising is the most common among bloggers, and is usually used with banners (headers and images), and with text ad blocks within the site's content. Cost-Per-Impression means you get paid for the number of times an ad appears on your site. For example, let's say an advertiser pays you $1 for 10 impressions. Whenever someone visits your website, that ad is displayed to them, and the required number of impressions drops by one. When 10 people visit your site, you are paid $1. Again, Google AdSense is the leading such ad network. Usually, you are paid per 1,000 impressions. The amount can vary a lot, from under a dollar to around $50 etc. These ads provide a steadier income then CPC ads. CPA means Cost Per Acquisition or Action. You get paid only when someone takes some action after clicking on your ad, such as making a sale or leaving their email address or similar. Usually, such are have a greater value than CPC or CPM ads. 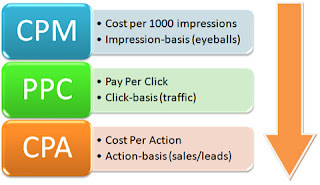 But the Acquisition rate is usually lower than CTR (Click Through Rate). ClickBooth and MediaWhiz are both good CPA ad networks. Affiliate ads are a type of CPA ads, except there's a sale as the 'action'. You get to promote products from an advertiser. Whenever someone buys that product through your referral, you get a percentage from that sale as commission. This type of advertising is very popular these days. In fact, almost every company nowadays has an affiliate program that rewards its promoters. Click on the following links to learn more about affiliate advertising. Images can be used for CPC or CPM ads. But there are dedicated ad networks for this, such as ImageSpace Media. Image ads can be used as pop-ups on a webpage, or pop-ups during videos like we see on YouTube. YouTube is the largest video hosting site on the internet. It allows you to sign up as a partner, after which you can integrate your account with AdSense. Video ads are simply videos that promote or give information about a certain product. You can use them anywhere. But people usually don't tend to open video ads, which is why you shouldn't use them frequently. Earning through classifieds is no easy task. But if you do it properly, you could e raking in money! Classified ads are special ads which are added by people buying, or selling products, services etc. Freelance job ads are a good example of this. EBay is a good classifieds website where people sell all kinds of stuff from wrist watches to cars etc. The advantage of classifieds is that, it attracts two-fold traffic. Advertisers as well as customers. You act as a platform between them. And you can charge a percentage from the sales made etc. But for sales to happen through your site, you need to have good credentials, and a good profile, so that people will trust you. In newsletter advertising, publishers send out ads with newsletters, or other information conveyed through email. These are shaky ground, however. People get annoyed at just seeing unnecessary emails in their inbox, let alone appreciating ads included with them. So do this very carefully. Getting sponsors is a job for the pros! If your website is popular and has a decent amount of traffic, you have the option of selling ad spots to sponsors. This will only happen if you are at the top, or near the top, of your niche though. So build some traffic and fan following before thinking more into this method. Qasim brother you are an excellent source of information, i am enjoying your posts very much. Your all posts have a tasty flavor of useful stuff, which every blogger needs to know. Adsense or Buysellads which one is better??? which one is the best option after google adsense ? Qasim, if this post is by you, as I see your about the author description, then why is it labeled in the Guest Post category as well?? Good article Qasim really i have learn lot from this..
Qasim has the admin authority (may be partial) and I definitely never considered him as a guest author and his post must not have been tagged as guest. About SEO, archives and labels are tagged as nofollow so I don't think it matters at all. If some other SEO aspect is there which our master knows, then we will need to wait till he comes back. hi..is there a way to have automatic numerical alerts like this..(2).. for the side links on my blog so viewers will know when new items appear?